After taking suo motu cognizance, the Allahabad High court seeks judicial probe report and ordered transfer of Kanpur SSP. 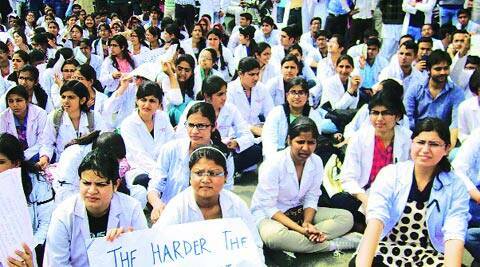 Junior doctors of PGIMS protest in Rohtak, Wednesday. Taking suo motu cognizance of the five-day doctors’ strike which is paralysing the medical facility in the state, the Allahabad High Court Wednesday ordered the UP government to transfer the officials, including Kanpur SSP Yashashwi Yadav, involved in the February 28 police action against medicos of GSV Medical College. The UP government, meanwhile, invoked the Essential Services Maintenance Act (ESMA) in the state to control the situation. Appointing senior advocate Jagdish Narain Mathur as the amicus curiae in the case, the court observed that any strike henceforth may amount to contempt of court, punishable under law, thereby bringing the Indian Medical Association’s call for a country-wide boycott of OPD services on Thursday under scanner. The court also asked for the state-constituted inquiry commission’s probe report on the police action following a clash between undergraduate students of GSVM and Samajwadi Party MLA Irfan Solanki. The court gave Justice Chauhan’s commission three weeks to submit its report. In directing the state government to transfer the police officials while the model code of conduct has come into place, the court had to overrule the provision which requires the state, under the circumstances, to seek permission from the Election Commission of India. The court was of the view that the gravity of the situation demands that the officials are transferred elsewhere. It also reminded the doctors of their Hippocratic Oath and “requested” the junior doctors to resume their duty while also permitting their association to intervene in the matter before the court. The court has fixed March 10 as the next hearing date. Meanwhile, a team of representatives from the IMA and GSVM students met SP chief Mulayam Singh Yadav. “He has assured us that he will talk to CM Akhilesh Yadav and asked us to take care of the patients. The strike, though, will continue,” Dr Ravi Mehra, state president of IMA, told The Indian Express. Kanpur DM Roshan Jacob said that while the government hospitals remained functional and emergency services were also in place, the strike continued and the 24 medical students against whom FIRs of rioting, loot and other criminal offence have been registered, remained in jail in spite of getting bail. The students, who were sent to judicial custody, were granted bail by the court on Monday but refused to sign the personal bonds required for the bail. The KGMU Teachers’ Association’s governing body, which met Wednesday, also decided to resign en masse if the matter is not resolved within 48 hours, informed Dr Naim Ahmad, the association’s general secretary.